Contested Constructions: Who Owns the City? Queer Cultures of Conflict – what’s that? Some Kind of Nature (2013-14) paints a surreal and mystical picture, which acts as an allegory for humankind’s relationship to nature. The images we see compel us to see beyond and behind what is seen. With special and sensual attention to rocks and trees, amplifying the poetry inherent in them, these inanimate beings begin to come alive and unfurl a communication of their own. Tejal Shah is interested in the (entangled) moment of becoming where human and nature collapse as independent, self-contained entities and emerge as a dense network of interdependences. 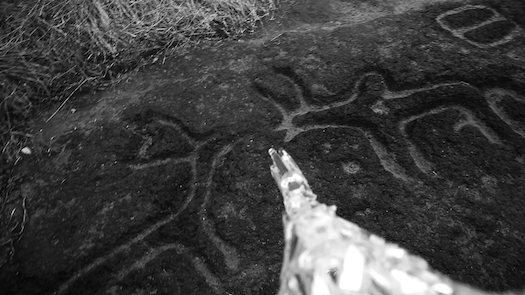 Shot entirely in Goa including the heritage site of Usgalimal Petroglyphs that are approximately 20,000 – 30,000 years old, the installation speaks to the interspecies anxiety we are experiencing in the anthropocene. The video reminds us that vision is a creation and not just a perception. Sounds of this video are rather gentle. Yet, they are mystifying: Is this the sound of a machine or a body; cracking or stepping; a dog, a bird, an insect? Some Kind of Nature. What kind of nature? Grass blades rubbing against each other in the wind; the gurgling of fast, but shallow water floating over stones; chirping, chirking, chittering of birds, humming of bees, clittering of crickets. Repetition, rhythm, continuation. Sound slowly zooming in and out. Quietness. The hybrid bird-like figure does not release any sounds. Tejal Shah (b.1979, Bhilai, India; currently lives in New Delhi, India) graduated with a BA in photography from RMIT, Melbourne and spent a year as an exchange student at The Art Institute of Chicago and another summer trying to get an MFA from Bard College. Her practice incorporates video, photography, performance and installation and focuses on “the inappropriate/d other” – one whom you cannot appropriate and one who is inappropriate. Que(e)rying everything, she creates alter-curious worlds riddled with fact, fiction, poetry and mythology, compelling us to re-engage with propositions on the complex relationships between interspecies, ecology, gender, sexuality and consciousness. Currently, she thinks of herself as some kind of artist working on some kind of nature. Caring for Conflict goes online! 05-04-2018—When does it become violence?